Adree is number, I don't remember, but it will come to me--remember, I have that filed somewhere. She is in there with the rest of the grand kids. I think she will be the 4th to be baptized. 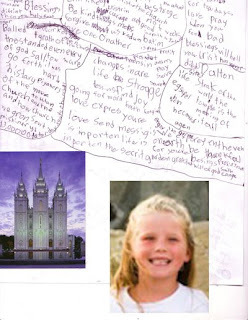 Her primary teacher asked her to take notes and so Dallin and Adree did. I used the back of her paper myself to make notes. This was just the first session's notes. She wanted Larin's Temple picture, but I told her it was a picture for her aunt's art project. She pick-out the one of The Salt Lake Temple and asked me if the speakers were talking from the temple. Adree studied it and said it was beautiful. The speakers were wonderful, all great. It always is. I wonder why I take notes? I will be reading them in the Ensign. I scribbled down as much as I could but I couldn't keep up. As usual, I felt like so many subjects applied right to me. President Monson now speaks so different as a Prophet of the Church. I can see the Mantle of the Prophet there. He touched us in so many ways, but when he spoke of the an extrodinary lady that struggled so much with her sight and having only one eye, we couldn't help but think, "Adree" This woman accomplished so much in her life. She was principal of 4 schools, went to two universities and wrote four books. I mention this because how it applies to Adree. She also has one eye. She has both, but one doesn't work at all, and it happened possibly at her birth. Adree listened and wrote more notes. One little girl getting ready for her baptism and she was hearing a wonderful uplifting message just for her and what she can do with her life. I believe it with all my heart, that she can accomplish much. Adree is amazing. Testimony blossoming. mother you make me cry. my adree is growing so much and is taking her baptism very seriously. thanks for always being ready to talk and help her learn. she loves her spot on the couch. i know she has learned so much from you. she loves you dearly.